PERi-PERi isn’t the only hot thing at Nando’s! Treat yourself to a nice hot cuppa and get a COMPLIMENTARY cup of the same! Come taste their new range of coffee and chocolate beverage that will end your yum in style. When last did you step into a space that made your heart sing as much as your taste buds? Or have you ever had Nando's succulent PERi-PERi Chicken, marinated for 24 hours before being flame-grilled to perfection and served with a smile? Never? 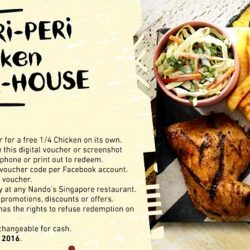 Here’s a chance to Try Something Nando’s with a FREE ¼ PERi-PERi Chicken! Today Only! 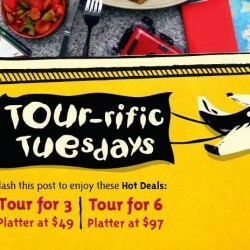 12 Jan 2016 Nandos: Save 20% on Tour-rific Platters Today! Head to Nandos for your dinner today and save 20% on their Tour-rific Platters for 3 to 6 pax! Flash the Facebook post to redeem and valid for dine-in only.